2016 saw the prohibition of lithium batteries (UN 3480) as cargo on passenger aircraft.A new revision to the UN Manual of Tests and Criteria, as well as a new lithium battery mark and Class 9 label for lithium batteries were also introduced. The 2017 IATA Lithium Battery Shipping Guidelines (LBSG) incorporates these and other updates to ensure the safe, efficient preparation of your lithium battery shipments. 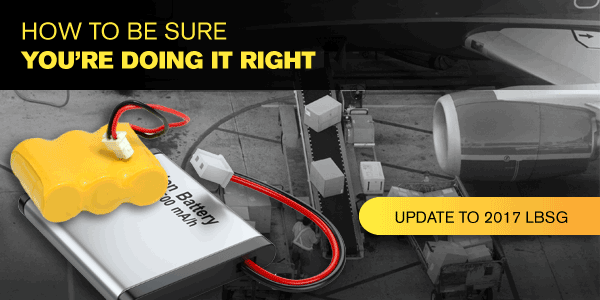 Whether youre shipping lithium batteries alone or equipment that contains them, the LBSG has all the information you need, with step-by-step instructions, in an easy-to-use format, so you can be sure your shipments comply with the latest international air transport regulations. Make it easy on yourself and your employees. Use the most up-to-date guide available.